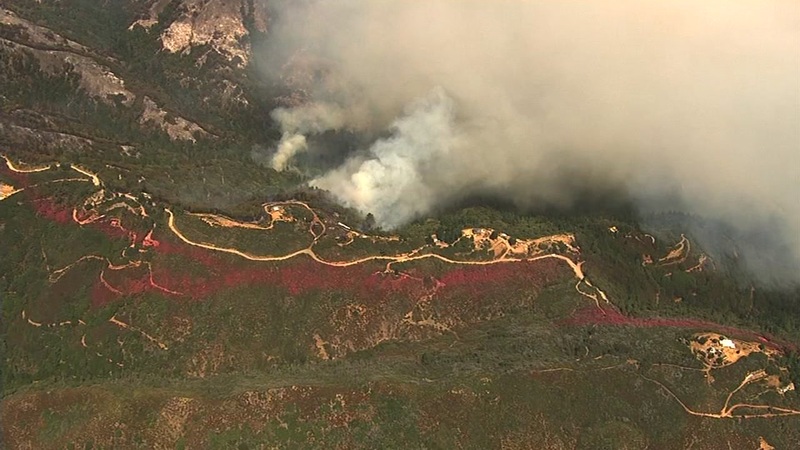 WATSONVILLE, Calif. (KGO) -- At least 1,000 firefighters are still battling the Loma Fire in the Santa Cruz Mountains, which has grown to 3,849 acres since it broke out Monday. So far, the fire is only 22 percent contained. Evacuations were lifted Wednesday afternoon for all Santa Cruz County residents, but road closures remain in effect for non-residents. Evacuation orders are still in place for residents in Santa Clara County. Firefighters have sent in reinforcements for the fire. "We were at 500 on Monday, yesterday we were at 800, today we're over 1,000. It doesn't matter what patch is on the side of a person's fire engine or a uniform. It's a single fire service and it's a single mission to fight this fire," said CAL FIRE Battalion Chief Jonathan Cox. The official count for destroyed or damaged homes remains at two, with an additional six out-buildings destroyed. At least 300 homes are still threatened. Firefighters are working 24 hour shifts and they are hoping to have the fire contained by Monday. For evacuees who want to get their large animals out of harm's way, two centers have been set up to take them in. Horses can be taken to the Graham Hill Showgrounds in Santa Cruz or the Santa Cruz County Fairgrounds in Watsonville. If you have other animals, please call ahead to see if they can take them. It feels cooler in the Santa Cruz Mountains w/ fog on the west side of the mountain. Hopefully this will help firefighters at the #LomaFire.